3,000 miles from home: being a Southerner on a daily basis. any weeks ago, in what now constitutes the month of June, I ventured for the first time to the southern part of the United States. My visit was not a vacation, as I had an appointment in a small North Carolina university as seminar director for a summer-intensive MFA program. So although I was not on holiday by any means, an assessment of what it means to be a Southerner entered my life on a daily basis. Travel, even when a particular trip is fraught with chaos and exhaustion, always teaches you something about the universe. This is what I learned in the one month I was almost 3,000 miles away from the Pacific Northwest. "Questions for Time Travelers: Buncombe County Chautauqua brings Civil War Figures to Life." Laughing and asking myself why this rated as a fresh topic of interest in 2005, I laid the article aside, only to come across the subject again and again. One of my students (a born Yankee) summed up the obsession as a matter of bitter economics. On my last day in N.C., a good friend who'd relocated to the region from upstate New York admitted he continued to be befuddled by the 140-year-old topic and handed me a book, "Confederates in the Attic," to read on the plane. Having previously lived in New York, a place ripe with avid sports fanatics asserting their baseball-capped allegiance as Yankee fans, the true meaning of being a Yankee was never apparent until I heard the terminology said with disdain. A "northern" accent is a pretty good giveaway that you are one. See previous entry. The low ebb: Southern cuisine's less than sophisticated fare. Before leaving, my partner gently chided me with the prediction I would gain a large heft from consuming the Southern cuisine. While I consciously stayed away from sampling fat back and red-eye gravy, there were, as predicted, many deep-fried choices to behold. Amazing barbeque and fried green tomatoes were found in the closest large town, Waynesville, and delectable delicacies at a faculty barbecue produced grilled romaine. The low ebb of the food chain was witnessed on a side trip to Dollywood, where deep-fried Twinkies and Snickers bars were a treat. 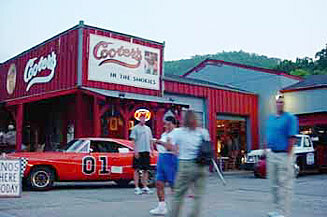 Dollywood's only non-belt-tightening offering consisted of a salad bar (iceberg lettuce, bleu cheese, black olives, croutons). On the flip side, in a small mountain town 20 minutes from where I lived were two delicious restaurants that could satisfy the needs of my vegan brother. Asheville has much sophisticated fare to behold; it was, however, 1.5 hours away. Someone told me you've never experienced the South until you've been to a Super Wal-Mart at midnight on a Friday evening. I'm happy to report that one of my first experiences in North Carolina was exactly that. I drove dark and curvy mountain roads in search of the only place within a 50-mile radius that could sell me toilet paper at that hour. I found entire families roaming the aisles in the one establishment that had its light on in the region. 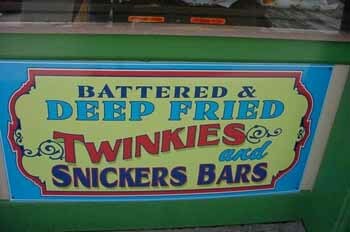 Hello Dollywood: where deep-fried Twinkies and Snickers bars are a treat. I think most of us who live in the Pacific Northwest are prideful of the amazing landscape we count as our backyard. 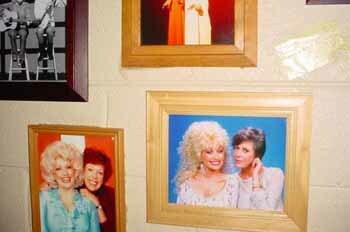 But living at the foot of the Great Smoky Mountains challenged my own regional vanity. Here was an area that boasts its own rain-forest climate and an oddly different landscape than what I'm used to. Tall trees hung with a natural haze. What you could decipher of the skyline was stunning and  especially after a typical afternoon rain break at sunset  the smell of the air was heavenly. It would be impossible to not mention the pervasiveness of The Christian Right in the region. I was reminded of this on a daily basis, from the lady at the post office refusing to accept a package in a shipping box originally containing wine (a Sharpie crossing out the term "alcohol" rendered the situation to my advantage) to a drive down the Billy Graham Parkway  all constant reminders to the prevalent thought. I observed a team setting up for a tent revival on the side of the road while driving on my way to the Smoky Mountain National Park. Billboards for assorted Christian bible schools or studies dotted the highway. One morning some students announced they had visited a museum that weekend, at Bob Jones University. I think the mountain air had gone to my head because I said I'd never heard of it. Of course, thanks to George W. Bush, I have heard of it. Unfortunately, Waynesville, the place of wonderful barbecue, had also been on the map recently due to a church incident. A plant more invasive and disdainful than blackberries  if that's possible. While driving through the tourist town called Cherokee, a million souvenir shops offered Confederate flag beach towels, baseball hats, bumper stickers and replicas that could be mounted on the back of your own car. 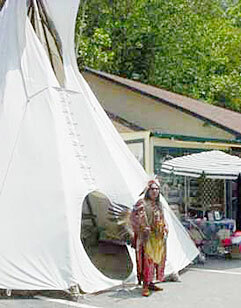 In the context of the gift shop, complete with a real live Native American in head-to-toe war paint posing next to a Plains tepee (waiting for photo opportunities), the idea seemed mildly amusing. While driving around small mountain towns and seeing the flag flown proudly in someone's front yard, the idea scared the hell out of me. The most insane reasons that I could be served a beer but couldn't be served a gin and tonic were laid out for me one night by a waiter trying to describe what constitutes a dry county. Meanwhile, one county over, there are drive-thru beer and wine stores. One night on campus I was invited to an Appalachian dulcimer program and was sweetly blown away. The music from the region is so sincere and heartfelt that I was honored to be in the room. A general lack of pretension was a comforting theme to the music and a reflection of the region itself. I had some eye-opening stories thrown my way on the racism topic. Some I am still processing. The most honest conversation I've ever had on the subject was with a woman visiting the art building who was a Georgia native. During the course of our discussion she related that during her childhood there were certain counties in Georgia you just didn't go to. This came up as she had taken a teaching job on campus and was trying to assess the local attitudes. I told her there was hope with the sight of vegan food and a culturally diverse bookstore only 20 minutes away  indicating, with any luck, open minds. Unfortunately, counties you should not visit still exist and I heard stories, all in the here and now, that made my stomach churn. If travel is considered one road to enlightenment, it's also another road to a quick reminder that the world isn't how you think it is in your safe corner. 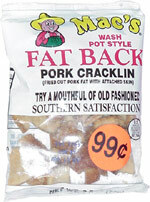 Food choices: adding heft with Southern delicacies. Writing this, I am reminded of a movie I saw in college, "Shocking Asia." The sensationalistic film is a biased documentary profiling practices in Asia that Westerners would find repulsive (Oh my God! They eat their young!). While listening to my rant on Dollywood food choices (and their subsequent effect on an entire population) a student reminded me that, as members of coffee-swilling, bicycle-obsessed, organic-chomping Seattle, we could be equally found obscene. True. I had to laugh. Back in Seattle, savoring the fact that I can now visit my liquor store on Sunday or order a green tea latte (kidding), I'm glad I know a little more about what makes this country tick, but I'm really glad to be home. Carolyn has a painting exhibit opening Sept. 1 at Seattle's Shift Gallery. Visit her Dangerous Chunky Web site, check out more of her writing in our archives and, if you'd like that grilled romaine recipe, e-mail her at carolynzick@gmail.com.